Brian Yanish (C'95) inks Licensing Deal! 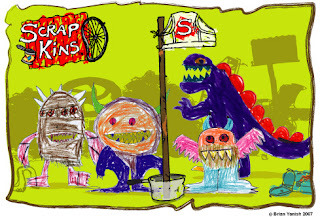 As a result of the June Licensing International tradeshow in which Brian Yanish (C'95, Mask and Wig) participated (check out our posts here), Brian emailed me to let me know that The Scrap Kins have made their first major Licensing Deal! From Brian, "We just signed a contract with Mighty Fine, an excellent Los Angeles based apparel company to produce T-shirts, sweatshirts and tops using The Scrap Kins artwork and characters. ...I'll keep you posted on details where and when product will hit stores. (Should be in a few months. )This is the first flag on the map for The Scrap Kins and we've got exciting things in the works." Stay tuned for the launch of his 2nd animated short online this fall. Click here to see his first short. For more info about Brian, click here to check out his site! Hitlon-ized: Off the Beat's "Breathe Me"
(C'11) Extreme Dorm Makeover: Got Ikea? On Campus: Where is this? Class of 2011 moves in!